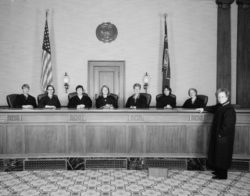 Oregon Women Lawyers and the U.S. District Court of Oregon Historical Society have formed Oregon Women Judges (OWJ) for the purpose of collecting, preserving and celebrating the histories and contributions of Oregon’s state and federal women judges. OWJ’s goal is to launch a website where we can publish and celebrate the stories of the 138 (and counting) women who have served in 178 judicial offices in Oregon. Among other things, we hope the website will inspire women lawyers to continue to seek judicial office, especially in judicial districts where no woman has yet served, or in courts where women continue to be few in number. The U.S. District Court of Oregon Historical Society is a 501(c)(3) organization. If you have any questions about donations, please contact Kathryn Roberts. If you are interested in volunteering for OWJ (particularly if you understand the world of website creation and maintenance), please contact Kendra Matthews.